This enlistment program option enables men and women to qualify for one of several Navy engineering or mechanical skill specialties (ratings) through on-the-job apprentice training. The training received as a Fireman or in the related engineering skill specialties is equivalent to that received as an electrician, electrical or power plant/co-generation plant operator or supervisor, diesel mechanic, or electronics repair technician. Equipment associated with Fireman training includes propulsion and, and diesel engines; electronic machinery plant control systems and networks; and intricate electrical wiring and distribution systems. The name Fireman enjoys a proud and storied history. The name originated in the days when the Fireman was responsible for keeping the fires burning in the ship’s boilers which were used to make steam. The steam-powered large turbines then produced the ship’s electricity and turned the ship’s propellers. After completion of recruit training, enlistees in the Fireman Apprenticeship Training program attend a three-week course on naval engineering fundamental skills in shipboard operations and evolutions. After successful completion of this training, Firemen are usually assigned to shipboard duties where the Navy needs them the most. Firemen can request and may receive on-the-job training in a rating that they are interested in, qualify for, and that is available at their first command by completing correspondence courses and personal advancement requirements. They must also be recommended by their Commanding Officer for the Navy rating they desire. Firemen may also attend special Navy schools to learn about general damage control, shipboard firefighting, preventive maintenance of special equipment, and the use of special tools used in the rating they are working in or seeking. Standing underway engineering watches and operating analog, digital and plasmatic display units. Working with qualified personnel to gain on the job training and experience, which will qualify for college credits. Must have normal color perception. Must have normal hearing. Security Clearance, (SECRET) required. Must be a U.S. Citizen. 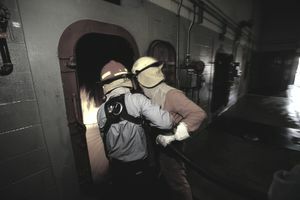 Firemen are taught fundamental skills needed in a shipboard environment. Most training takes place at the first duty station in the form of on-the-job training in the rating for which they are "striking." By "striking" for a specific Navy rating, a qualified person may be assigned to a Navy class "A" technical school for further training in that rating. Firemen may also be able to participate in advancement exams without additional schooling once qualifications for selection into the rating of their choice have been met.